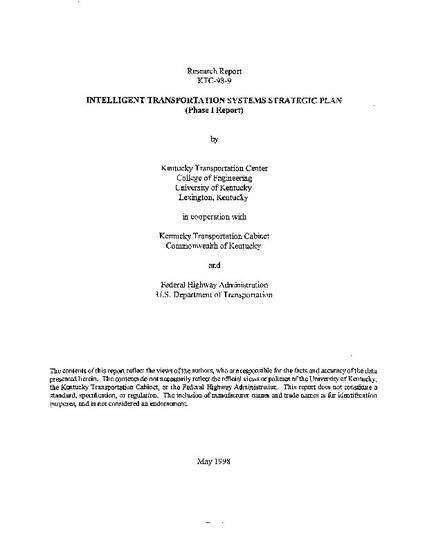 This interim report on an Intelligent Transportation Systems Strategic (ITS) Plan has been developed as documentation of the process of offering a vision for ITS and recommending an outline for organizational structure, infrastructure, and long-term planning for ITS in Kentucky. This plan provides an overview of the broad scope of ITS and relationships between various Intelligent Vehicle Highway Systems (IVHS) functional areas and ITS user service areas. Three of the functional areas of ITS have been addressed in this interim report with sections devoted to mission, vision, goals, and potential technology applications. Within each of the three areas, recommendations have been made for applications and technologies for deployment. A more formalized business plan for will be developed to recommend specific projects for implementation. Those three functional areas are 1) Advanced Rural Transportation Systems (ARTS), 2) Advanced Traveler Information Systems (ATIS), and 3) Commercial Vehicle Operations (CVO). A survey of other states was conducted to determine the status of the development of ITS strategic plans. Information received from the 11 states that had completed strategic plans was used to determine the overall approach taken in development of the plans and to evaluate the essential contents of the reports for application in Kentucky. Kentucky's ITS Strategic Plan evolved from an early decision by representatives of the Kentucky Transportation Cabinet (KyTC) to formalize the procedure by requesting the Kentucky Transportation Center to prepare a work plan outlining the proposed tasks. Following several introductory meetings of the Study Advisory Committee, additional focus group meetings were held with various transportation representatives to identify ITS issues of importance. Results from these meetings were compiled and used as input to the planning process for development of the Strategic Plan components of ARTS and ATIS. The development of a strategic plan for Commercial Vehicle Operations originated from a different procedure than did the other functional areas of ITS. As part of well-developed commercial vehicle activities through the ITS-related programs of Advantage I-75 and CVISN, Kentucky has become a national leader in this area and has developed a strategic plan of advanced technology applications to commercial vehicles. The strategic plan for Commercial Vehicle Operations was developed out of the convergence of several parallel processes in Kentucky. Empower Kentucky work teams had met over a two-year period to develop improved and more efficient processes for CVO in Kentucky. Their conclusions and recommendations encouraged the further activities of the Kentucky ITS/CVO working group that first convened in the summer of 1996. In an effort to conceptually organize the various ITS/CVO activities in Kentucky, and as a commitment to the CVISN Mainstreaming plan, an inclusive visioning exercise was held in early 1997. Out of this exercise emerged the six critical vision elements that guided the CVO strategic plan. The remaining functional areas to be included in the ITS Strategic Plan will be addressed in the second phase of this study. Those areas are Advanced Traffic Management Systems (ATMS), Advanced Vehicle Control Systems (AVCS), and Advanced Public Transportation Systems (APTS). It is anticipated that a process similar to that developed for the first phase of this study will continue. The contents of this report reflect the views of the authors, who are responsible for the facts and accuracy of the data presented herein. The contents do not necessarily reflect the official views or policies of the University of Kentucky, the Kentucky Transportation Cabinet, or the Federal Highway Administration. This report does not constitute a standard, specification, or regulation. The inclusion of manufacturer names and trade names is for identification purposes, and is not considered an endorsement.